We’ve been waiting for a long time to tell you all about this one - and it’s a good’un! 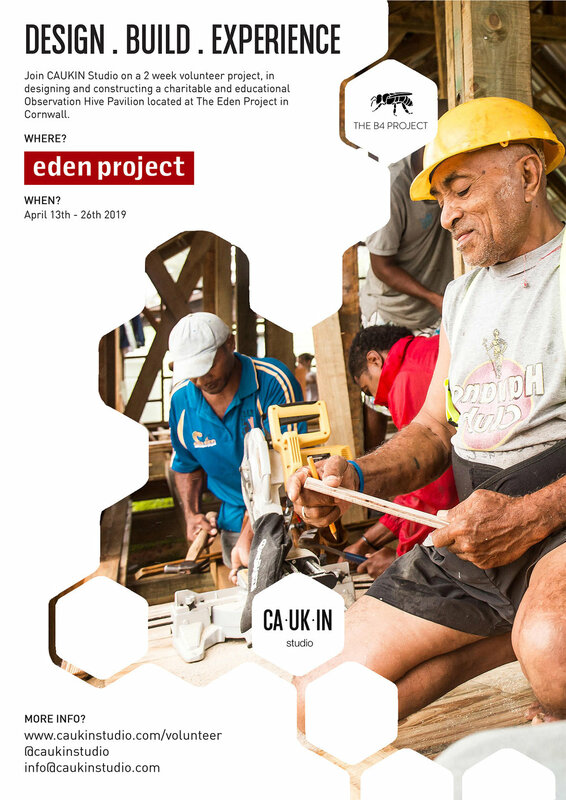 CAUKIN Studio will be working with The B4 Project and The Eden Project to design and build an Observation Bee Hive! Join us in April 2019 (13th - 26th) for 2 weeks to build the structure and learn about design, construction and bees! The scheme is in partnership with The B4 Project, who are working to conserve, protect and increase the population of the UK’s native honey bee, Apis mellifera mellifera. The pavilion will display the intrinsic connection between the local plants and wildlife, specifically Apis mellifera mellifera and native Cornish flora, whilst simultaneously acting as a sculptural beacon, connecting Eden’s biomes and the Core to their new Cornish native corner. You will have a chance to explore the eden project whilst learning about design and getting stuck in with the construction of this space! See www.caukinstudio.com/volunteer for more info! 2018, another year over! | Where are they now? Sign up to our mailing list to be the first to know about new projects, project updates, and volunteer opportunities! CAUKIN Studio does not share your information with third parties.